Can U.S. alliances withstand Trump's venom? WASHINGTON - After two years under rhetorical assault from U.S. President Donald Trump, America’s alliances have somehow held up. This year, however, the constraints on Trump’s anti-alliance instincts are falling away, and a mix of internal and external pressures are endangering several key alliances at once. This trend is most visible with respect to NATO. The trans-Atlantic alliance has been a target of Trump’s ire for decades. Since taking office, he has berated European leaders, waffled on America’s Article 5 commitment to protect allies, and even mused about withdrawing from the pact. Yet for two years, largely thanks to the initiative of Congress and the Pentagon, day-to-day relations with NATO remained relatively steady. The administration increased spending on military activities meant to deter Russian aggression. The alliance also took steps to improve its military readiness and address unconventional threats such as cyberattacks and information warfare. This progress, however, was largely dependent on the presence of committed, pro-NATO officials in the American bureaucracy. Those officials are becoming scarcer by the day. 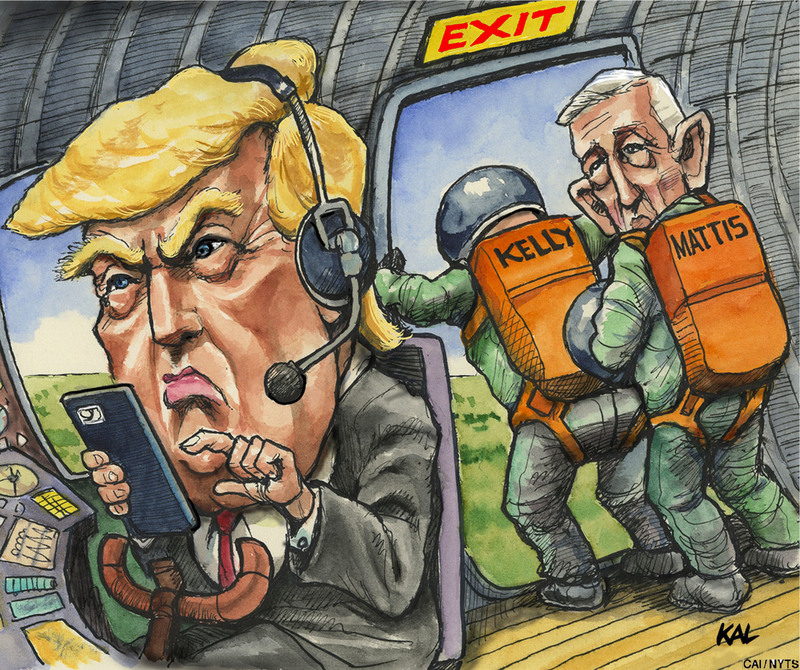 Secretary of Defense James Mattis is gone, replaced by an acting secretary — Patrick Shanahan — who seems more inclined to fulfill the president’s wishes. National Security Adviser John Bolton and Secretary of State Mike Pompeo are not anti-NATO, but their hostility to the European Union poisons their relationships with European colleagues. 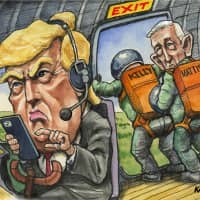 Less visibly, several key Pentagon and State Department officials responsible for the NATO portfolio — Assistant Secretary of Defense Robert Karem, Deputy Assistant Secretary of Defense Thomas Goffus and Assistant Secretary of State Wess Mitchell — have left or will soon leave their posts. None of this means that Trump is likely to withdraw from NATO. Bipartisan support for a recent House resolution that seeks to prevent Trump from unilaterally pulling out of that alliance is a clear warning of the political price he would pay for doing so. The most likely scenario is that there will simply be less constructive leadership from Washington — less ability to propose new initiatives or even respond to allies’ ideas — at a time when NATO confronts major challenges from Russia and illiberalism is surging within the alliance. Things are no better on the other side of the world. The Japan-U.S. alliance has come through the first half of Trump’s term in stronger shape than one might have expected, given the president’s three-decade history of Japan-bashing. Yet the strains are subtly mounting. Prime Minister Shinzo Abe’s assiduous personal cultivation of Trump did not prevent the president from peremptorily withdrawing from the Trans-Pacific Partnership in his first week in office. Now, Abe fears that Trump may cut a grand bargain with China at Japan’s expense, or make a deal with North Korea that similarly ignores Tokyo’s security concerns. And while the challenges in the Japan-U.S. alliance are merely simmering, the problems may be coming to a boil in two other alliances. The U.S.-South Korea alliance is in crisis, as negotiations on the amount Seoul pays to defray the costs of the American troop presence have deadlocked. According to South Korean officials, U.S. negotiators asked for a dramatic hike in these payments, casting doubt on whether Washington was dealing in good faith. The fact that the U.S. side has asked for annual renegotiations — as opposed to a multi-year agreement — has heightened concerns that Trump will simply ask for more again next year. The resulting impasse may lead the Pentagon to stop paying South Korean contractors starting in the spring. It could also give an American president who has never liked the U.S. presence on the Korean Peninsula an excuse to begin reducing that presence. Last year, Congress passed legislation prohibiting the Pentagon from cutting U.S. troop levels in South Korea below 22,000 (from the current 28,000). That prohibition can be circumvented, however, if the secretary of defense certifies that doing so is in the national interest. Making the future of the alliance even more precarious is that this internal dispute is happening at a critical stage in U.S.-North Korea diplomacy. As the upcoming summit with Kim Jong Un approaches, Trump will surely be tempted to make a big concession that will jump-start moribund negotiations on North Korean missiles and nukes. Given how little he cares for the U.S. troop presence in the first place — and given that he suspended U.S.-South Korean military exercises after his previous summit with Kim — the president may try to kill two birds with one stone. He could withdraw some U.S. forces as a way of appeasing Kim and punishing the South Koreans for not paying up. Doing so would be a gift to Pyongyang, Moscow and Beijing: It would be a big step toward undermining the alliance with Seoul and America’s position in Northeast Asia. Finally, America’s most important alliance in Southeast Asia is also entering a danger zone. For years, the U.S. has refused to clarify whether the Mutual Defense Treaty with the Philippines covers the islands and reefs that Manila controls in the South China Sea. That ambiguity is meant to avoid writing a “blank check” that Manila might cash by provoking China. Yet given how rapidly China’s expansionism is shifting the balance of influence in the region, ambiguity is rapidly becoming untenable. Since 2012, when the U.S. failed to prevent Beijing from seizing control of Scarborough Shoal, Filipino officials have worried that Washington cannot deter the Chinese salami-slicing that is paring away their country’s sovereignty. Making matters worse, the U.S. has formally clarified its commitment to defending the Japanese-administered Senkaku Islands in the East China Sea, while evading questions about whether it has a parallel commitment to the Philippines. Further fueling the crisis is the fact that the Philippines now have a president — Rodrigo Duterte — who is openly skeptical of the value the U.S. defense commitment provides. As a result of all this, Philippines Secretary of National Defense Delfin Lorenzana has been signaling that Manila may re-evaluate its commitment to the Mutual Defense Treaty if Washington doesn’t clarify its position. Yet the Trump administration has so far been silent, perhaps because American officials sense that this issue will be a loser with a president who sees alliances as burdens. A position of continued American ambiguity will probably not lead Duterte to pull out of the alliance. But it may reinforce his belief that Chinese power will ultimately dominate Southeast Asia, and that Manila should accommodate rather than resist the inevitable. That, in turn, would make it far harder for the U.S. to rally the region against Chinese revisionism; it would subtly but unmistakably erode America’s position in Southeast Asia. To be fair, the crisis of this particular alliance is not really Trump’s fault. Reassuring an exposed ally — while also restraining that ally from unwise actions — would test the abilities of even a competent, committed administration. Yet the chances that things could turn out badly, with the Philippines or any of these allies, are only heightened by the fact that America currently has a hollowed-out administration led by this particular president. Since Trump took office, U.S. foreign policy wonks have worried that his presidency would be a period of grave peril for America’s alliances. This might be the year that proves them right. Hal Brands is a Bloomberg columnist and the Henry Kissinger distinguished professor at Johns Hopkins University’s School of Advanced International Studies.